The James Arms were granted to Trevenen James (1794-1867) in February 1845. Though his ancestors had been yeoman farmers from west Cornwall, he became a successful businessman, banker and tin merchant, and like many men in similar position in early Victorian England, wished to establish his credentials as a Gentleman. He therefore applied to the Earl Marshall for a Grant of Arms, which was duly given to him on 20th February 1845, no doubt in exchange for a substantial fee. Symbols used in heraldry usually have some significance. In this case, the cornish chough is clearly a reference to the family's county of origin, while the scallop shell is the emblem of the apostle St James, thus alluding to the family surname. The significance of the upturned triangle is less obvious. It might simply be there to differentiate Trevenen James's Arms from those of some other family - for example, the Peter family of Harlyn have Gules [red], on a bend [a diagonal stripe from top left to bottom right] between two escallops Argent, two Cornish choughs, proper.1 However, I prefer to think that it might be an example of the complex, subtly allusive, and sometimes slightly indecent punning and humour that is characteristic of heraldry. Several members of the James family have had the misfortune to suffer from the painful and embarrassing condition of inflamed haemorrhoids, commonly known as "piles". It is well known that there is a hereditary component in the tendency to this condition, and perhaps Trevenen James was making a subtle reference to this when he included an upturned triangle, known as pile in heraldry, as one of the symbols on his coat of Arms. The original document granting the Arms still exists, and is now owned by Geoffrey Fox, who is the stepson of Eric Trevenen James (1904-1989), a great-grandson of the grantee. The magnificent illuminated scroll, carrying the seals of the Garter and Clarenceux Kings of Arms, remains in its original oblong box. TO ALL AND SINGULAR to whom these Presents shall come, Sir Charles George Young, Knight, GARTER Principal King of Arms and Joseph HAWKER, Esquire, CLARENCEUX King of Arms of the South East and West Parts of England from the River Trent Southwards send Greeting. Whereas Trevenen James of Tavistock Square in the County of Middlesex, and of St. Columb, Truro, Falmouth and Penzance in the County of Cornwall, Banker, hath represented unto The Most Noble Henry Charles, Duke of Norfolk, Earl Marshal and Hereditary Marshal of England that he is uncertain of Armorial Ensigns pertaining to his family, and unwilling to bear any without lawful Authority. He therefore requested the favor of his Grace's Warrant for Our granting such Arms and Crest as may be proper to be borne by him and his descendants and by the other descendants of his Father Francis James, late of Trevabyn in the said County of Cornwall, Gentleman, deceased, with due and proper differences according to the Laws of Arms. And forasmuch as the said Earl Marshall did by Warrant under His hand and Seal bearing date the thirtieth day of January last authorize and direct us to grant and assign such Arms and Crest accordingly Know Ye therefore that We the said GARTER and CLARENCEUX in pursuance of His Grace's Warrant and by virtue of the Letters Patent of our several Offices to each of Us respectively granted do by these Presents grant and assign unto the said Trevenen James the Arms following, that is to say Sable, on a Pile between two Escallops in Base Argent, a Cornish Chough rising Proper. 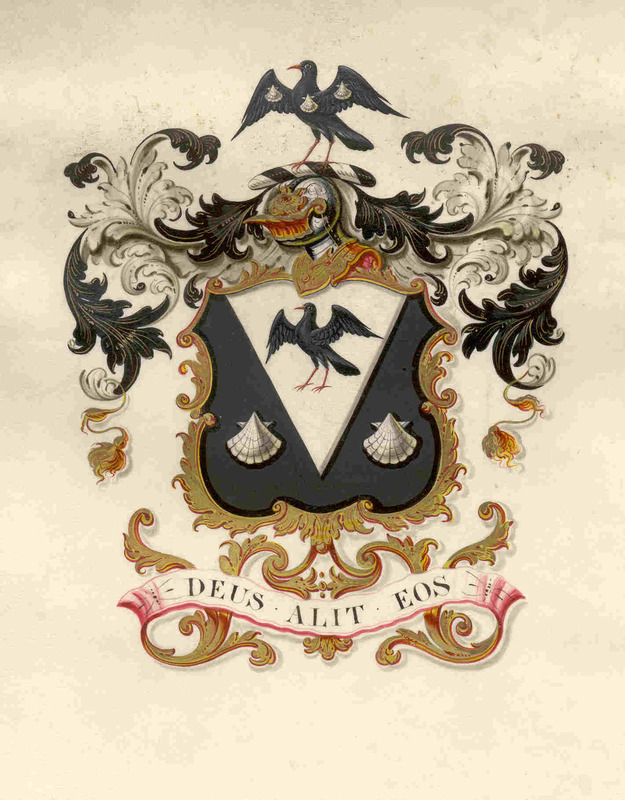 And for the Crest, On a Wreath of the Colours, a Cornish Chough rising Proper charged upon the breast and upon each wing with an Escallop Argent, as the same are in the margin hereof more plainly depicted to be borne and used for ever hereafter by him the said Trevenen James, and by his descendants and by the other descendants of his Father, Francis James, deceased with due and proper differences according to the Laws of Arms. In Witness whereof We the said GARTER and CLARENCEUX Kings of Arms have to these Presents subscribed Our names and affixed the seals of our several Offices this twentieth day of February in the Eighth Year of the Reign of Our Sovereign Lady Victoria by the Grace of God of the United Kingdom of Great Britain and Ireland, Queen, Defender of the Faith &c, and in the Year of Our LORD One Thousand Eight hundred and Forty five.